Son of John Bambrick (b1791) and Harriett Ann Redlan. 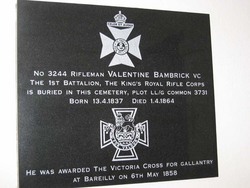 Bambrick's grave in St Pancras Cemetery is unmarked, so a plaque was mounted in the Chapel of the Cemetery in 2002. Bambrick's medals are not publicly held. 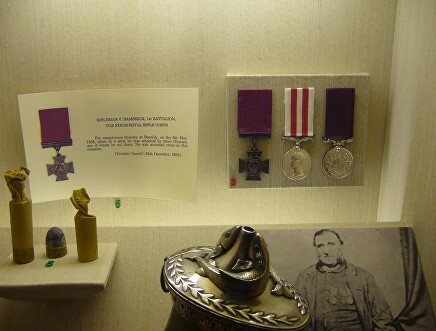 In 2012, replicas of his medals were displayed at the Royal Green Jackets Museum, Winchester. (Picture - Thomas Stewart). 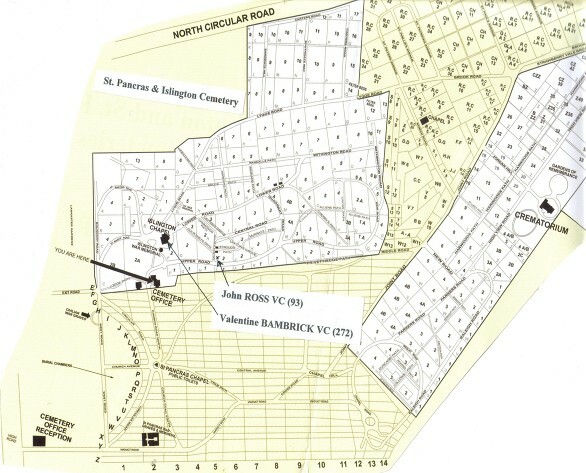 Sadly there is no headstone of the grave of another military hero, Victoria Cross awardee, Valentine Bambrick (1837-1864). Bambrick received the VC after being attacked at Bareilly in 1858 during the Indian Mutiny. 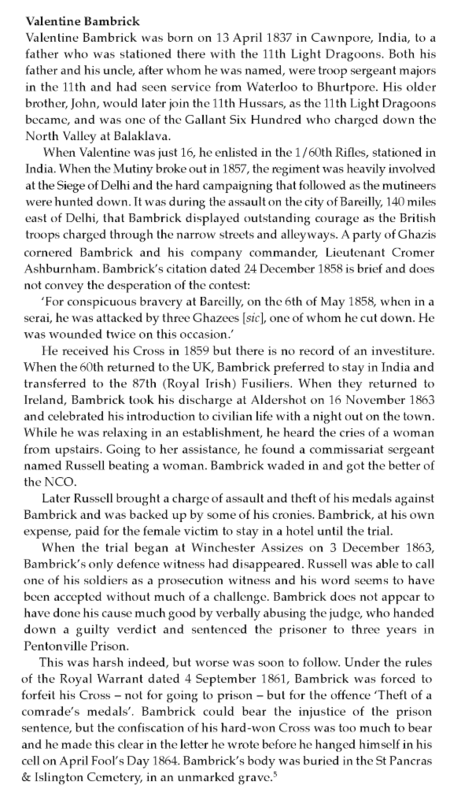 Three years later, in London, Bambrick was convicted of assault and theft of a comrade's medals. He was thus stripped of his own medal and sent to Pentonville Prison, Whilst there, the stricken Bambrick killed himself. He was then buried in a pauper's grave. 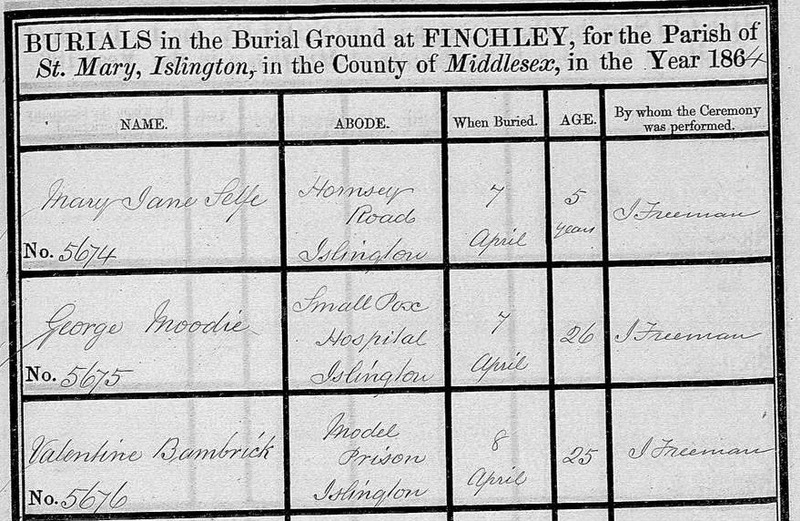 Perhaps one of the only momentoes of his death is this record found on the Deceased Online database of 25 year old Bambrick's burial in the cemetery at Finchley on 8 April 1864. A memorial plaque was belatedly erected to him in St Pancras and Islington Cemetery in 2002. Extract from "The Victoria Crosses that Saved an Empire: The Story of the VCs of the Indian Mutiny"
An inquiry of a melancholy character was instituted by Dr.
a similar inquest was held. before mentioned to you in my letter. him. He only knew deceased by his number, G 21.
diet you have given to you? did he instruct you as to what you were to say here? that special letter had been forwarded to the friends. lost and the deceased was accused of the robbery. jury. The body could be buried either by them or otherwise. The Courier (Brisbane, Qld. : 1861 - 1864)  Sat 12 Mar 1864  Page 3  FLOGGING IN THE ARMY. From the Daily Telegraph, December 8.
with mo. You may hang me if you like." could she have done against a strong man? that touching appeal on her behalf. would soon develop these to their full extent. but it has made many a goon one bad.